From the valley’s dirt roads, views include the surrounding hillsides, vineyards, and farm country. The sky is dark, the kind of inky black that only exists without a single streetlight. We bounce down the washboard dirt road and, when it forks, turn toward our destination: the area’s best new restaurant. Or is it the other way? The road keeps twisting and branching off. My husband, Todd, grips the official map of Baja California’s main wine region, Valle de Guadalupe. All day we used this map, with its cartoonish purple icons of grape bunches indicating wineries, to sip our way among the valley’s 50 wineries. Visiting them often means venturing off the area’s three paved roads onto rutted dirt ones, but Todd laughs now at our assumption that the straight brown dotted line we took to be a shortcut would translate to a straight road. He tosses the map to the floor, I pull a U-turn, and we carefully retrace our path back to the “highway”—a paved two-laner that links the port city of Ensenada, 20 miles to the west, to the border town of Tecate. This is a booming wine country, with new tasting rooms, a couple of fine restaurants, and hotels with high-thread-count sheets, but it still has a wild side. And for a moment, the utter darkness gives me a familiar feeling, like the one I get hiking in the wilderness or paddling my surfboard into a wave. The natural world is powerful. Each dish that comes is a surprise: a pesto of beet greens served with a thick hunk of rosemary bread that’s been both baked and smoked. A salad of broccoli, radishes, and Ramonetti (a soft, local cheese akin to a blend of brie and manchego) with an orange calendula flower and parsnip purée artfully arranged on a slab of slate. Then it’s a piece of perfectly seared fresh tuna bathed in a tangy sour-milk and mint-oil broth, served in a warm stone bowl. After that, roasted partridge with carrots, roasted pumpkin purée, and beef sauce, paired with a spicy Vena Cava Tempranillo from the winery at Villa del Valle, the B&B where Corazón de Tierra is located. Finally, it’s Hernandez’s dessert oeuvre, each tasting portion made from fresh oranges: ice cream, panna cotta, marmalade cake, and a cookie. Hernandez is building on the region’s farm-to-table legacy established by the valley’s first and most renowned farm-to-table restaurant, Laja, where during a delicious, epic meal the night before, I learned that the restaurant’s refrigerators and freezers often sit empty—the fresh ingredients never make it there. In this Mexico, there’s an easy blend of traditional and new, refined culture—and it’s all shaped by nature. The long growing season allows for a vast array of produce and wine grapes with exciting, complex flavors. All around the valley, people are utilizing the bounty to create special flavors: Farmers raise lambs that go into both fine cuisine and roadside tacos; cowherds graze their animals with precision to please French-style organic cheese­makers; stalks of Swiss chard, naturally salty from soil that used to lie at the bottom of the sea, flavor a dessert. The wines, too, carry a river of sea salt, captivating when not overblown. As in all fast-emerging wine regions, the wines here still span a palate-challenging range of quality. Wine grapes were originally planted in the valley by Jesuit priests in the 18th century. The first visitor boom began in 2006, when the ribbon of road between Ensenada and Tecate was paved. Production is so small, and Mexico’s wine tax so high, that very few wines are exported—the only way to taste them is to visit. Tourism took off, and with San Diego only 1 1/2 hours away (it took us less than 4 hours from Los Angeles), wine-curious Americans led the way, making up about 75 percent of the visitors. In 2008, the economic downturn and a rash of drug violence on the border inverted the numbers. Around the same time, something surprising happened: Beer-loving Mexicans started drinking wine (their annual consumption has doubled in the past 10 years). It’s still mostly Mexicans from the mainland who visit the valley’s wine route. But since last year, the cartel wars have essentially ceased, and Americans looking for an adventure have begun coming back. I’m on horseback, being led by a Mexican telenovela star turned stablemaster at Adobe Guadalupe winery. Small clouds hover above the mountains to the east, and we clop past Nebbiolo vines burrowing into the orange-red clay soil, planted when Don Miller and his wife, Tru, started the winery in 1999. “There were 12 wineries here back then,” Don says later, as we sit in his modern art–filled wine cave tasting 10 of his elegant wines. Don, with his peacoat and tufts of white hair peeking out from a newsboy cap, reminds me of Frank McCourt as he spins the yarn of how he had been a finance guy in Laguna Beach, California, with a passion for wine. “It became my dream to grow grapes and make wine when I retired,” he says. So he and Tru, drawn by the idea of an experimental, frontier wine country, built Adobe Guadalupe, a winery and upscale B&B that was then one of the few hotel options for visitors. Don explains that the valley capitalizes on the grapes from warm southern Europe—Tempranillo from Spain, Nebbiolo from Italy, and Grenache, Carignane, and Syrah from France’s Rhône Valley. And valley winemakers love unorthodox grape mashups even more than mavericks north of the border. There’s been a recent quality renaissance, Don says, as locals figure out what grows well where, and what varieties blend to positive effect, led by the pioneering Hugo D’Acosta, an enologist educated in France and with winemaking experience in Italy and the Napa Valley. Wine pioneer Hugo D’Acosta at the local wine school. For the rest of the weekend, we bounce around tasting, at Barón Balché, with a mountain backdrop and an underground barrel room, and at Las Nubes, founded in 2008 by a Sonoran enologist backed by a group of Mexican investors, whose new tasting room has giant windows offering sweeping views of the valley. 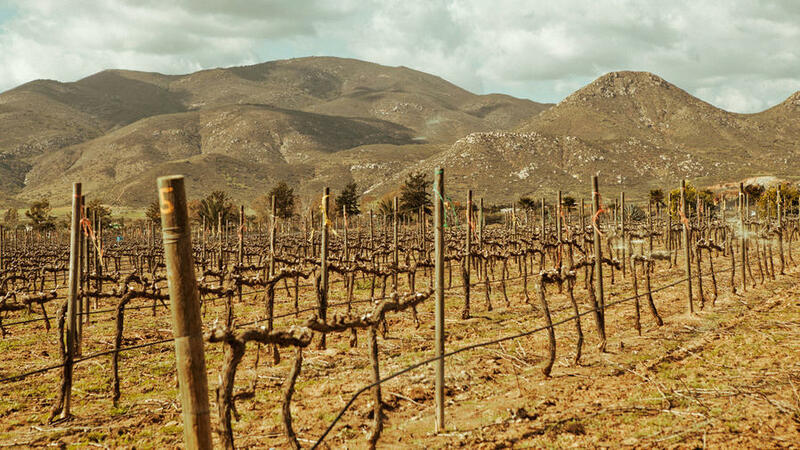 Spend the weekend tasting and then bring some prized Baja wines home. In the area’s one town, El Porvenir, we stop in at Estación de Oficios Porvenir, a winemaking school founded by D’Acosta in 2004. La Escuelita (the Little School), as locals call it, is a collection of six buildings, all made from recycled materials. The yearlong winemaking program enrolls roughly 20 students per session. Upon graduation, they may give it a go, like Juan Carlos Bravo, a longtime organic grape grower in the region, who now bottles two wines under his JC Bravo label. We tour La Escuelita, where they also offer tastings from the school’s own wine label. It takes me 15 minutes in the coffee shop to realize that the walls are made of old mattress springs, leaving the shop open to the elements and offering blue-sky views through the coils. Walking to the bottling room, I see that its earthen walls are inlaid with rows of empty wine bottles. It’s a fitting juxtaposition. Some to consider bringing home (there’s a 1 liter per person border-crossing limit), plus where to eat and stay. At Corazón de Tierra, dishes are created from a palette of local flavors.